Spoiler alert: We already know whose winning all the country duo/group awards at the 2029 Grammys! Little Big Town, one of the most popular country groups, revealed some big news during E! 's Live From the Red Carpet at the 2019 Grammys: Their kids want to form their own group...and they already have a band name and they're already charging for their shows! "It started on the bus because they're on the tour with us all the time, and they have dance parties, and they perform," Karen Fairchild told Giuliana Rancic. "They make the crew pay tickets...we give them back their money. They bring the crew on the bus and they're like, 'Watch us perform!' They call themselves the Little Big Kids!" Hey, we'd totally watch them perform! 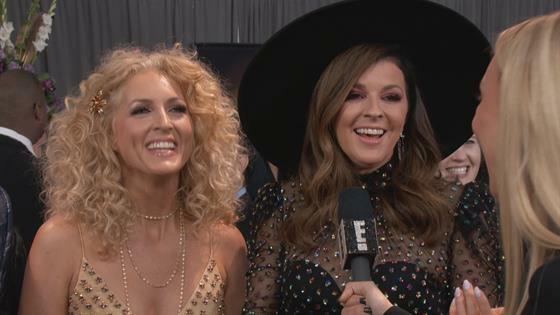 And here's a tip quick for Little Big Kids can pick up from their folks, considering LBT, up for Best Country Duo/Group Performance for their hit song "When Someone Stops Loving You," has been together for over 20 years. So what's the secret for maintaining such a great musical relationship? "We really love each other. We've gone through so much life together, " Kimberly Schlapman said. "As high up as you can go, as far down as you can go, we've lived it together. We're family that's why we're still together." But Philip Sweet was quick to add, "And we're not afraid to have a good time!" The band is expecting to have a good time win or loss at the Grammys because they are part of the big musical tribute forDolly Parton, their "dream collaboration!"